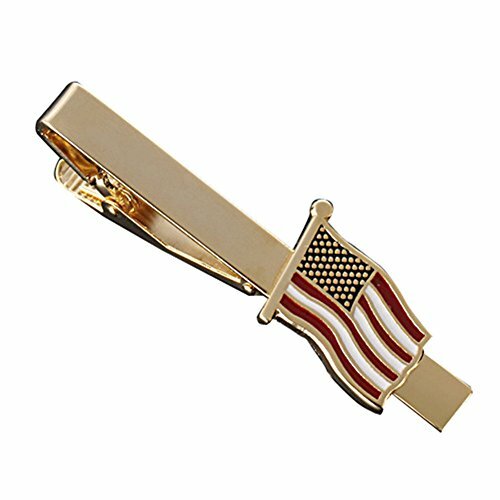 MGStyle Tie Bar Pinch Cilp For Men - 2.16 Inch For Regular Ties - the Old Glory Stars & Stripes American Flag - Gold Tone - Stainless Steel with Deluxe Gift Box by MGStyle at Resha Laser. MPN: FBA-US-B-0090. Hurry! Limited time offer. Offer valid only while supplies last. Do you want Customized Engraving from us? Customized Engraving is free to anyone. Customized Engraving is only available for items shipped by seller. Do you want Customized Engraving from us? Customized Engraving is free to anyone. Customized Engraving will take 3-5 more Business Days to ship. Customized Engraving Content should be confirmed immediately after payment. Want to add a Novelty Accessory to your Business or Formal Shirt? Presenting: Novelty Tie Clip for Men from MGStyle! Why Choose a Tie Clip from MGStyle? Our Tie Clip is made of the best Stainless Steel/Metal Alloy, designed with the latest popular elements, suitable for most kinds of ties. Want to Impress Your Boss at Work? Our Tie clips firmly grip onto your tie and shirt for a completely nonslip hold. When removed, the clip leaves absolutely no evidence of ever touching your delicate fabrics. Smooth texture allows the tightest grip without any sort of damage to your expensive silk ties. While our tie clips give you a sharp and competent image at the office, they are also excellent accessories to any event involving a tie. Impress guests and friends at your dining occasions, outdoor events, dates, weddings, holidays, interviews, any professional occupation involving movement(such as health care, retail, food service, art industries etc),day to day workdays or funeral. We accept returns or exchanges if you receive defective or unsatisfactory items. We offer at least One Year Replacement Guarantee. Size: 2.16 In. (Length) x 0.24 In. (Width); It's the Perfect Size for Regular Ties in US. Metal: Stainless Steel. Smooth texture allows the tightest grip without any sort of damage to your expensive silk ties. Packaging: Deluxe Gift Box. It's a Perfect Gift for Father, Boyfriend, Husband, Groomsmen or Business partner on different festivals. Such as Christmas, Father's Day or Valentine's Day. Occasions: Tie Clip will make you more Fashionable and Official in Social Occasions. Wear one to your next Wedding, Formal Dinner, or Meeting at Work! Usage: Tie Clip should be worn between the 3rd and 4th buttons on your dress shirt. Each tie clip is equipped with a Double Mechanism to ensure your tie stays in place for a Professional and Modern Look. If you have any questions about this product by MGStyle, contact us by completing and submitting the form below. If you are looking for a specif part number, please include it with your message.